I thought I would start posting some craft projects for the holidays. Here are a few from my holidays last year. The last two include free printables for you. I need some fresh ideas, so comment if you have some ideas or good links for me!!! Thanks… I love the computer iron-on paper and I am always looking for new things to create with it. In the past I have created T-shirts, favor bags, & tote bags. 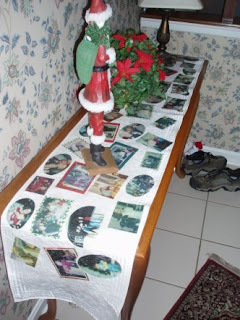 When we are home in PA for Christmas, I always do Christmas Eve dinner and I wanted to have a fun centerpiece last year… I bought a table runner and printed some pictures of Christmas pasts (dating back 30 some years) on the iron on paper. I ironed the pictures onto the runner and had a great centerpiece. It got my family saying, “remember when…” I gave the runner to my mom as a gift after the dinner, since she loved it so much. 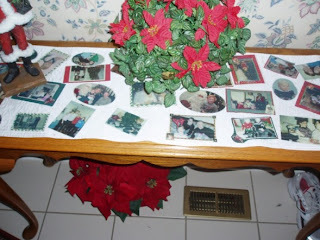 Here is a picture of it in her home… I may and try and do this for my husband’s family this year. If you plan to try this craft, I suggest you purchase the Avery paper. You can purchase it at Walmart, K-Mart, Target, and your local office store. Another fun holiday thing to share. 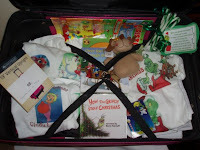 I created a nice gift idea for the child in your life… It is called Grinch on a Trip. 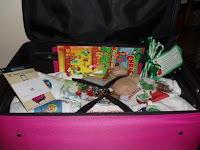 Just get a suitcase, buy some white shirts in your child’s size, get iron on computer paper, a Christmas Coloring Book, some green candy canes, the Grinch Book, and download the Grinch Soundtrack. Put this all in a suitcase and you have a great gift… see below. PS. I found the little dog stuffed animal at the dollar store. Too cute! 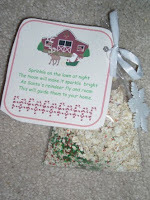 I think this is the last item I would like to share tonight… I made Reindeer food last year for my son’s class and decided to change the tag I made a few years ago. I put the food in clear plastic bags and tied a Santa charm on the bag. It was a nice treat for the class. My son loves to sprinkle the dust every year. Click to download my PDF file of this fun tag! Click here for more Holiday Printable Craft Treat Ideas!!! You will see my snowman soup treat and some other cute treats!